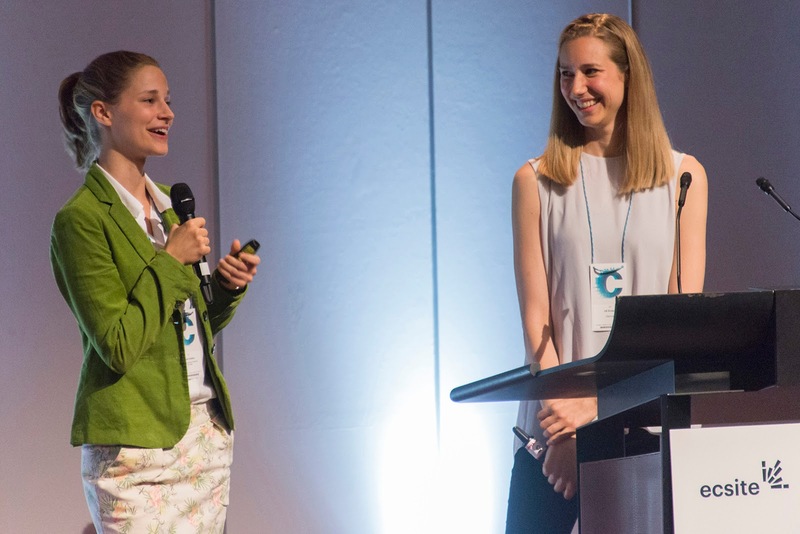 A record-breaking 1,182 professionals from 58 countries gathered in Geneva, Switzerland recently for the 29th edition of the Ecsite Conference. Well, that's your headline. But the real nitty-gritty of this year's gathering of the European network of science centers and museums was exemplified by the conference theme of "Creative Collisions." Thursday started well with a "Newcomers Breakfast" event. Small tables allowed for interaction between groups of "newbie" conference attendees. Each table also included members of the Conference Planning Committee or more "seasoned" attendees to provide tips to get the maximum benefit out of the Ecsite gathering. Then the "Business Bistro" (what is normally called the exhibit hall or similar in the U.S.) opened to conference attendees. 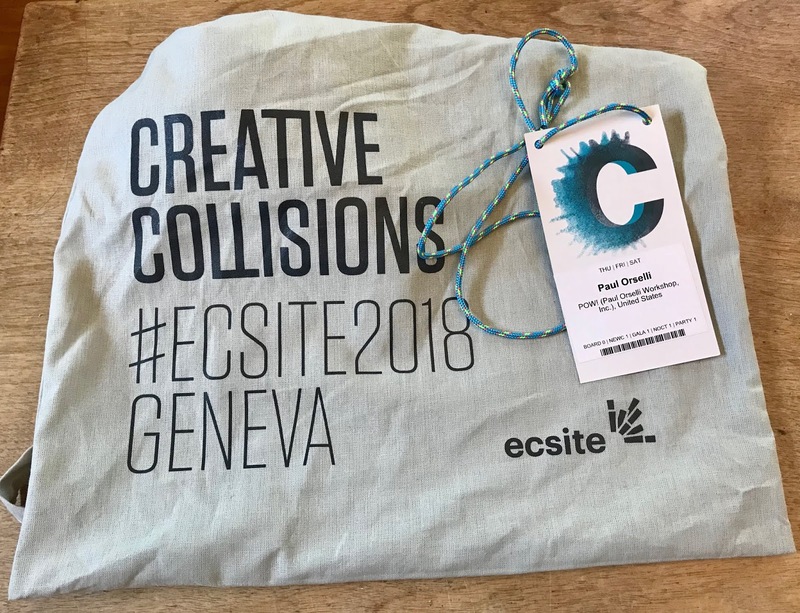 At Ecsite the exhibition hall is a true "bistro" combined with coffee break stations and regularly scheduled opportunities to socialize and meet and network (Creative Collisions!) I was surprised at the good number of vendors from outside the European Union, including a booth from the Museum of Science in Boston advertising the "Science of Pixar" exhibition. 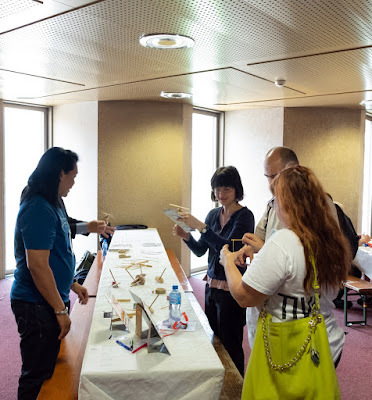 There were also numerous coffee breaks and dessert breaks after lunch held at stations in different parts of the Business Bistro, which added to the sociable feeling evident throughout the entire Ecsite Conference. The Bistro was a natural spot for conversations and "creative collisions." Well done! The first session I attended was called "Challenging our brains to come up with new ideas." Each panelist shared a short presentation about their own creative process. It was interesting to see the different approaches each panelist used to inform their own creative practice. On each day there was a communal lunch break that was included in the conference registration. Attendees sat at shared tables and ate and chatted together. This is very different from other museum conferences I have attended, where participants usually scatter in a hundred different directions during meal breaks. I think more North American conferences should adopt this shared mealtime (and networking!) practice. My last session on Thursday was an off-site tour of CERN, the massive scientific complex a short bus ride away from the center of Geneva. We received a wonderful tour from a volunteer guide, Jose originally from Portugal, who is an engineer with the ATLAS project. Jose was enthusiastic and really knew his stuff! 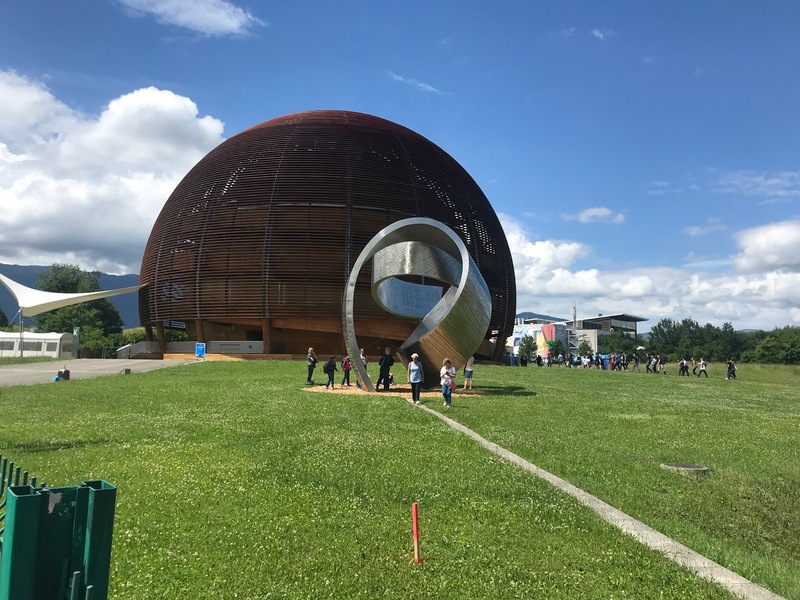 Our tour lasted for several hours, and we visited four different spots --- two areas more akin to museums/visitor centers, but also two areas with "real" stuff --- the control room for the ATLAS project, and the facility where they test the many, many superconducting magnet assemblies inside the Large Hadron Collider (LHC). As one of my Facebook friends said, commenting on pictures of the tour, "It looks like nerd nirvana!" Friday started out for me with a session called, "Small and big sins of science communication." This was a fun session filled with audience participation. As we entered the session room we noticed a long yellow line (made of Post-It notes!) dividing the space in half. The format allowed one person to "confess" something that they or their museum had done, and then session participants could stand on the "Yes, I have done that" or "No, not me" side of the room, responding to the original confession. It was agreed that whatever was shared inside the workshop room would be kept in confidence, so attendees shared some difficult and emotional things. I liked the session very much, and the fun format really lets you see in a strong visual way the shared concerns that all museum professionals have. 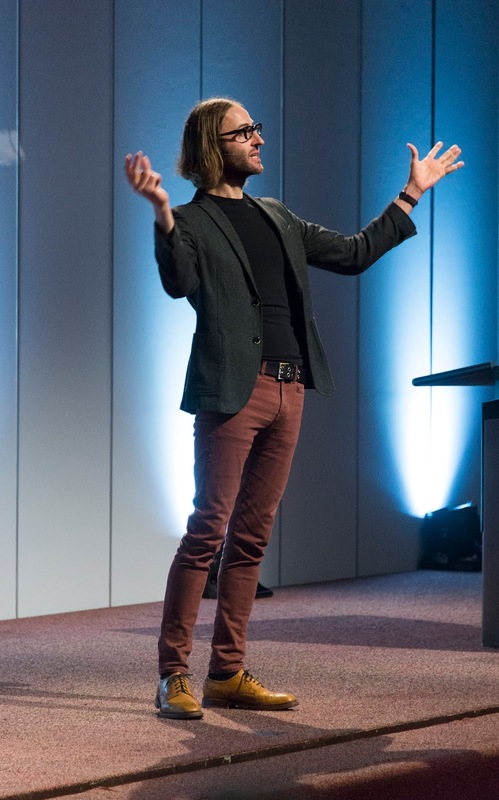 Everyone was energized and excited after James Beacham's presentation as we moved to the late morning sessions. I participated in a two-part session on either side of the communal lunch break, "The exponential potential of narrative." In Part One, speakers shared concrete examples of the power of narrative in their work. One of my favorites was the unlikely use of a video production using Santa Claus, Princess Elsa (from Disney's Frozen) and Jon Snow (from Game of Thrones) to share concerns about climate change! In Part Two, we divided into small groups (one of which I facilitated) to develop narratives on a specific topic. It was great fun, and a great format. My biggest takeaway was that narrative can be part of the content, design, and even the physical environment in museums. 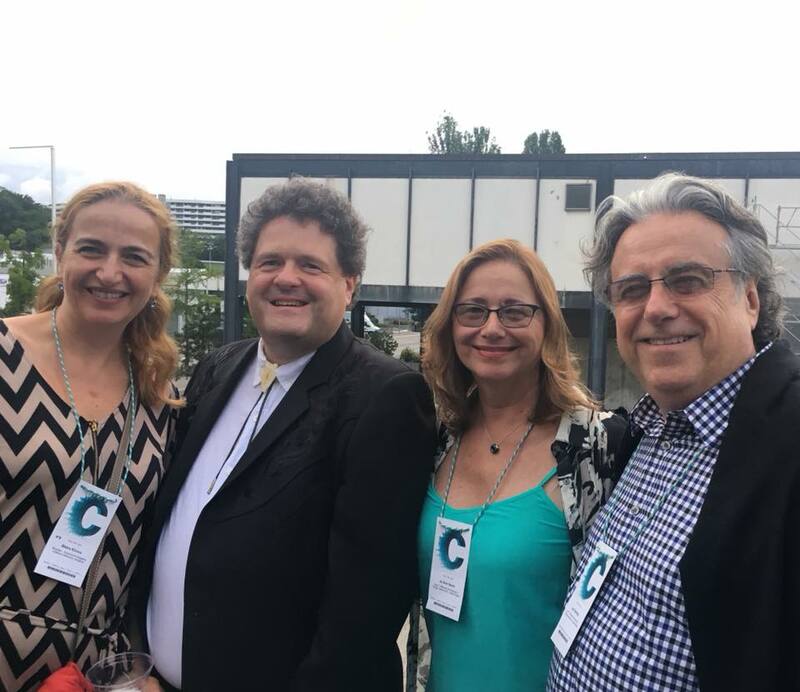 Friday finished with a "Business Bistro Happy Hour" where each vendor's booth served drinks and snacks (usually from the exhibitor's home region or country --- so Franconian whiskey from Germany or Cheetos from the USA!) During an event like this, it is important to remember that many small drinks = several large drinks. I left the event very happy, and I imagine the number of signed contracts increases during this particular event as well! Saturday provided a strong finish to Ecsite 2018, with my first session called "Designing tinkering activities" that happened in the Conference's Maker Space. 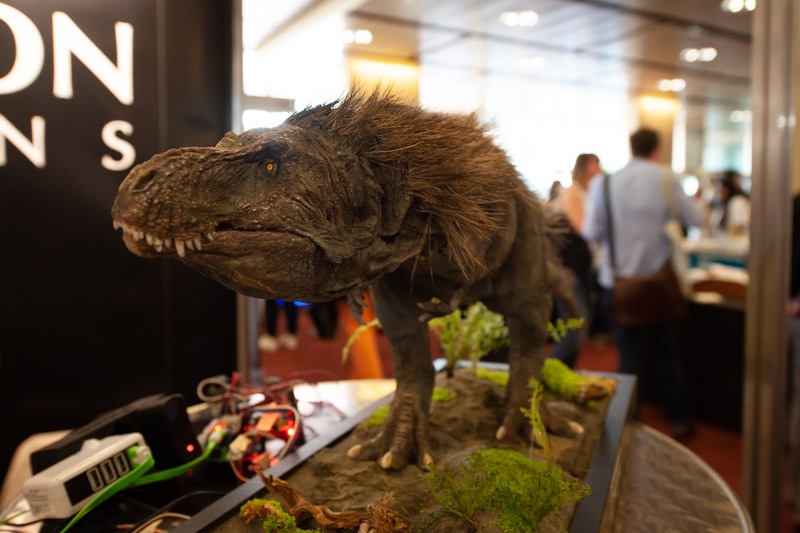 It was fun to tinker, tape, and solder in a session of course, but my real takeaway was that the Ecsite 2018 Conference had both a dedicated Maker Space (filled with materials and volunteer staff for both drop-in and scheduled sessions) as well as a "GameLab" (a volunteer-staffed space filled with both digital and analogue gaming/game materials, also for drop-in or scheduled sessions.) 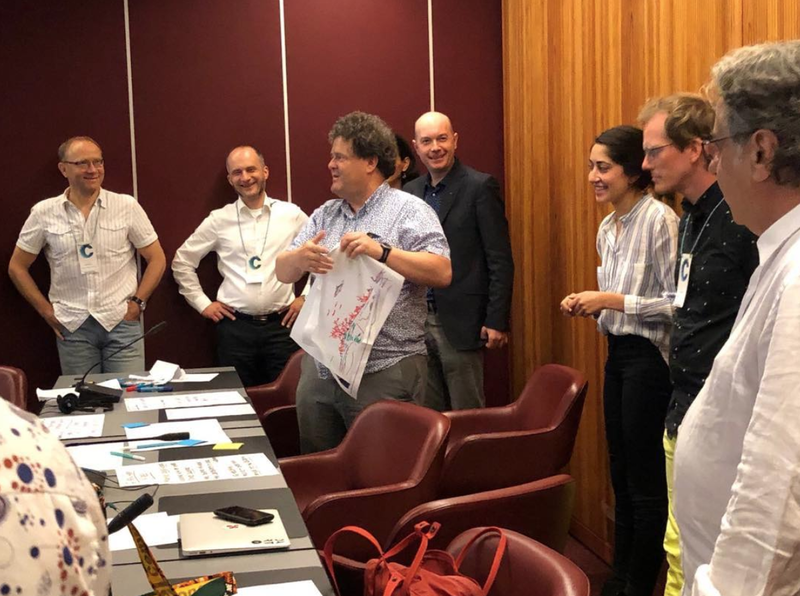 I saw several folks from ASTC in Geneva, so I hope they were taking notes about the possibility of having similar spaces at the ASTC Conference. The Saturday keynote speakers had a difficult task, given the success of James Beacham's Friday talk, but the endlessly charming Enders sisters (Giulia, the author, and Jill, the illustrator) creators of the worldwide bestselling book "Gut: The Inside Story of Our Body's Most Underrated Organ" were completely up to the task! Appropriate for the "Creative Collisions" conference theme, Jill and Giulia gave their talk on stage together and spoke about their shared creative process -- both good and bad. At all times, their love for each other as siblings as well as creative partners shone through. Plus they were funny! A definite A+ for this talk, which Ecsite has also kindly provided on YouTube. Saturday finished in a blur with a trip to the "Grand Bazaar" session, a series of hands-on opportunities at different tables with different presenters in a large room where conference attendees could wander at will. The session and activities were great, and what a pleasure (and small world!) to see Peeranut Kanhadilok from the National Science Museum in Thailand again, after meeting her a few years ago at an ASTC Conference. The session I attended in the very last slot of the conference was called "Delicious Science"! Each presenter discussed food-related programming at their museums, and then each presenter made some food or presented a food experiment that workshop participants could sample. The session was well-attended, perhaps because of the tasty topic, but also because the last day of the Ecsite was a FULL day, not a HALF day, as in most North American conferences. I'm sure this cut down on people leaving early on the day before -- definitely something North American museum conference planners should consider. 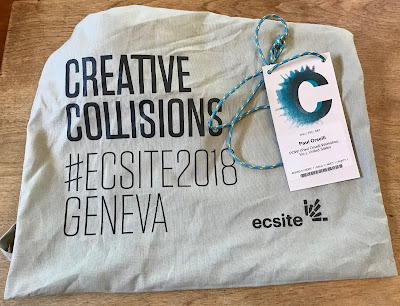 I enjoyed all the "creative collisions" during my first Ecsite Conference very much. I'm sure it won't be my last!